Symphony No. 0 “Cancelled”: Bruckner doesn’t exactly go out of his way to sell this Symphony to us, does he? But, as the tortuous revision histories of many of his symphonies demonstrate, the composer’s painfully self-critical attitude to his own works is never a reliable indicator of their worth. In fact, the Zero Symphony postdates the First and, to my ear at least, is superior, closer in spirit to the Second and Third, if not quite as involved, nor as long. The “Studiensinfonie,” No. 00, by contrast, is very much an early and exploratory essay in the form. It is a kind of graduation piece, written in 1863, immediately after the end of Bruckner’s studies with Otto Kitzler. Given Bruckner’s stylistic trajectory over the course of his numbered symphonies, we might expect to hear the influence of Schubert and Haydn here, but in fact Schumann and Mendelssohn are stronger voices. In No. 0 we hear Bruckner’s mature musical personality, perhaps not yet fully formed but clearly recognizable. In No. 00 we have to strive much harder to make the connection, although there are plenty of clues in the detail. My first exposure to the Zero Symphony was via a recording from Stefan Blunier and the Beethoven Orchester Bonn (MDG 937 1673-6). Blunier makes a good case for the work, not making any concessions for its early date, seeking out, and often finding, the depths of expression we more naturally associate with the later symphonies. But this new version from Marcus Bosch is even better, slicker, better structured, and more dramatic all round. The most significant difference between the two versions is in the tempos, Blunier takes 50:11 while Bosch is finished in 41:23. Yet Blunier never feels lethargic, nor does Bosch feel rushed. Both apply a good deal of rubato, allowing for supple and naturally shaped phrases at their respective speeds. Both orchestras play well, and both are captured in excellent SACD audio. Bosch is a little stiff in the second movement Andante (despite its tempo marking a clear ancestor of the great adagios of the late symphonies) and the phrases occasionally feel clipped. However, the rest of his interpretation is excellent, particularly the Scherzo, which he drives home with thundering intensity, and the Finale, which is dramatic, varied, and nuanced throughout. Symphony No. 00 is a more modest conception, and Bosch is wise to avoid the extremes that he applies to the later work. But his reading isn’t exactly “Classical” either. There is still plenty of rubato, and he is generous with the freedom he allows the woodwind soloists (more prominent here than any of the composer’s later works). There is no getting away from the fact that this is a minor work, but Bosch makes the best possible case for it. 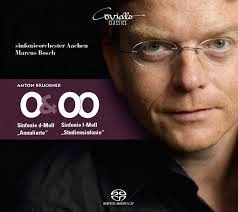 This release marks the end of a complete Bruckner symphony cycle from Marcus Bosch and his Aachen forces. The project has been on the go since 2003, when an Eighth Symphony recording was so well received that it gradually brought about an entire cycle. Coviello claims that this is the first complete Bruckner cycle on SACD. That may or may not be the case, but the “complete” appellation is certainly appropriate; not only are these to early symphonies included, but these is also a Finale for the Ninth Symphony, edited by Nicola Samale, Giuseppe Mazzuca, John A. Phillips, and Benjamin-Gunnar Cohrs.The way Bosch approaches Bruckner is unlikely to be to everybody’s taste, his tempos are generally fast, although he’s not of the “revisionist” school: However fast he takes the music there is always plenty of ebb and flow, and usually very wide-ranging dynamics. Of the releases I have heard, my favorite is the Second Symphony. Like the Zero Symphony here, Bosch demonstrates through his impassioned but controlled performance that the Brucknerian tendencies of the late symphonies are just as evident early on, they just need a committed interpreter who doesn’t make concessions to their slightly narrower musical vocabulary. Most of the cycle was recorded in the church of St. Nikolaus in Aachen, which has proved an ideal acoustic, the reverberance round and clean, adding further gravitas to Bruckner’s quasi-liturgical statements. This recording was made in a different Aachen church, St. Michael, which I assume is smaller. It is certainly equally appropriate to the music at hand. A box set of the entire cycle was issued at around the same time as this release. Although Bosch’s fast tempos might make some of the individual movements less attractive, I suspect that, in its entirety, the cycle will be well worthwhile, especially for the sheer drama he draws from this music, the quality of the orchestra, and of the recorded soundscape, both from the acoustic itself and the SACD engineering. Of the individual discs, the early symphonies deserve the highest recommendation, the Second Symphony in particular, but also this, although chiefly for the Zero Symphony, by far the finest of the two compositions on the disc.